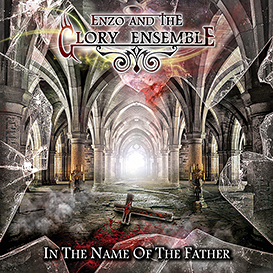 “In The Name Of The Father“, the most ambitious Christian metal project ever made, with the participation of distinguished guests such as Marty Friedman, Kobi Farhi (Orphaned Land),Ralph Scheepers (Primal Fear), Mark Zonder (Fates Warning & Warlord ), Gary Wehrkamp and Brian Ashland (Shadow Gallery) and Nicholas Leptos (Warlord), will be out on December 24, 2015. The album, mixed and mastered by Gary Wehrkamp-Shadow Gallery at “New Horizon Studios”, will be published in an exclusive elegant digipak package and will be an unmissable work for fans of Turilli’s Rhapsody, Myrath e Symphony X. Cover realized by Jahn Vision Art.